This is a guest post from Trevor Sullivan, a Seattle-based Solutions Architect at Amazon Web Services (AWS). In this blog post, Trevor shows you how to deploy a Windows Server-based container cluster using the AWS Tools for PowerShell. Building and deploying applications on the Windows Server platform is becoming a significantly lighter-weight process. Although you might be accustomed to developing monolithic applications on Windows, and scaling vertically instead of horizontally, you might want to rethink how you design and build Windows-based apps. Now that application containers are a native feature in the Windows Server platform, you can design your applications in a similar fashion to how developers targeting the Linux platform have designed them for years. Throughout this blog post, we explore how to automate the deployment of a Windows Server container cluster, managed by the Amazon EC2 Container Service (Amazon ECS). The architecture of the cluster can help you efficiently and cost-effectively scale your containerized application components. Due to the large amount of information contained in this blog post, we’ve separated it into two parts. Part 1 guides you through the process of deploying an ECS cluster. Part 2 covers the creation and deployment of your own custom container images to the cluster. You’re using a Windows, Mac, or Linux system with PowerShell Core installed and you’ve installed the AWS Tools for PowerShell Core. Or you’re using a Windows 7 or later system, with Windows PowerShell 4.0 or later installed (use $PSVersionTable to check your PowerShell version) and have installed the AWS Tools for PowerShell (aka AWSPowerShell module). You already have access to an AWS account. You’ve created an AWS Identity and Access Management (IAM) user account with administrative policy permissions, and generated an access key ID and secret key. You’ve configured your AWS access key ID and secret key in your ~/.aws/credentials file. This article was authored, and the code tested, on a MacBook Pro with PowerShell Core Edition and the AWSPowerShell.NetCore module. NOTE: In the PowerShell code examples, I’m using a technique known as PowerShell Splatting to pass parameters into various PowerShell commands. Splatting syntax helps your PowerShell code look cleaner, enables auditing of parameter values prior to command invocation, and improves code maintenance. 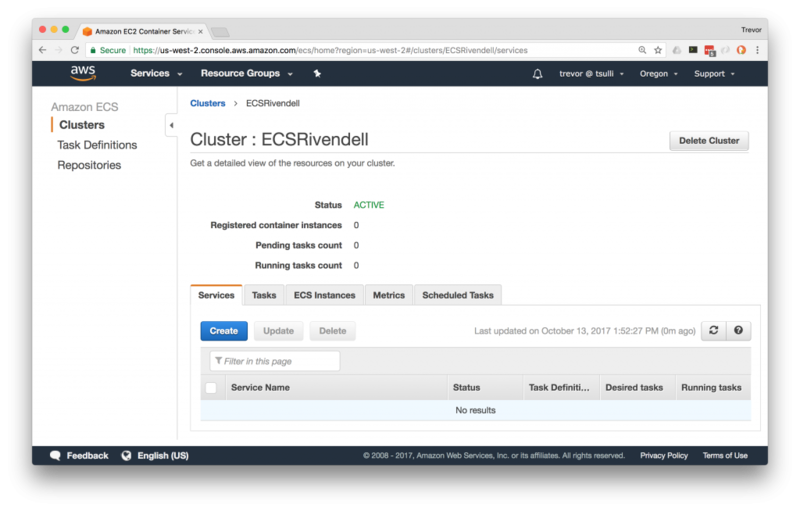 The first task is to create an empty ECS cluster. Right now, the ECS beta support for Windows Server containers doesn’t enable you to provision your compute layer for the cluster, at cluster creation time. In a moment, you’ll provision some Windows Server-based compute capacity on Amazon EC2, and associate it with your empty ECS cluster. If you prefer to use the AWS PowerShell module to create the empty ECS cluster, you can use the following command. Amazon EC2 instances can have IAM “roles” assigned to them. By associating one or more IAM policies with an IAM role, which is assigned to an EC2 instance by way of an “instance profile”, you can grant access to various services in AWS directly to the EC2 instance, without having to embed and manage any credentials. AWS handles that for you, via the IAM role. Whenever the EC2 instance is running, it has access to the IAM role that’s assigned to it, and can make calls to various AWS APIs that it’s authorized to call via associated IAM policies. Create an IAM policy that defines the required permissions for ECS container instances. Register the IAM policy with the role. Create an IAM instance profile, which will be associated with your EC2 instances. Associate the IAM role with the instance profile. First, you use PowerShell to create the IAM policy. I simply copied and pasted the IAM policy that’s documented in the Amazon ECS documentation. This IAM policy will be associated with the IAM role that will be associated with your EC2 container instances, which actually run your containers via ECS. This policy is especially important, because it grants your container instances access to Amazon EC2 Container Registry (Amazon ECR). This is a private storage area for your container images, similar to the Docker Store. The next part is easy. You just need to create an IAM role. This role has a name, optional path, optional description and, the important part, an “AssumeRolePolicyDocument”. This is also known as the IAM “trust policy”. This IAM trust policy enables the EC2 instances to use or “assume” the IAM role, and use its policies to access AWS APIs. Without this trust policy in place, your EC2 instances won’t be able to use this role and the permissions granted to it by the IAM policy. Now you simply need to associate the IAM policy that you created with the IAM role. This association is very easy to make with PowerShell, using the Register-IAMRolePolicy command. If necessary, you can associate more than one policy with your IAM roles that grant or deny additional permissions. With the IAM role prepared, you now need to create the IAM instance profile. The IAM instance profile is the actual object that gets associated with our EC2 instances. This IAM instance profile ultimately grants the EC2 instance permission to call AWS APIs directly, without any stored credentials. Finally, you need to associate our IAM Role with the instance profile. Now that you’ve created an empty ECS cluster and have pre-staged your IAM configuration, you need to add some EC2 compute instances running Windows Server to it. These are the actual Windows Server instances that will run containers (tasks) via the ECS cluster scheduler. To provision EC2 capacity in a frugal and scalable fashion, we create an EC2 Auto Scaling group using Spot instances. Spot instances are one of my favorite services in AWS, because you can provision a significant amount of compute capacity for a huge discount, by bidding on unused capacity. There is some risk that you might need to design around, as Spot instances can be terminated or stopped if your bid price is exceeded. However, depending on your needs, you can run powerful applications on EC2, for a low price, using EC2 Spot instances. The Amazon Machine Image (AMI) that instances will be launched from. NOTE: Be sure you use the Microsoft Windows Server 2016 Base with Containers image for Windows Server container instances. The EC2 instance type (size, vCPUs, memory). Whether to enable or disable public IP addresses for EC2 instances. The bid price for Spot instances (optional, but recommended). The EC2 User Data – PowerShell script to bootstrap instance configuration. Although the code snippet below might look a little scary, it basically contains an EC2 user data script, which I copied directly from the AWS beta documentation for Windows. This automatically installs the ECS container agent into new instances that are brought online by your Auto Scaling Group, and registers them with your ECS cluster. echo "Download doesn't match hash." echo "Expected: $expectedMD5 - Got: $actualMD5"
$script =  "cd '$ecsExeDir'; .\amazon-ecs-agent.ps1"
$jobpath = $env:LOCALAPPDATA + "\Microsoft\Windows\PowerShell\ScheduledJobs\$jobname\ScheduledJobDefinition.xml"
echo "Job definition already present"
Be sure you give your EC2 container instances enough storage to cache container images over time. 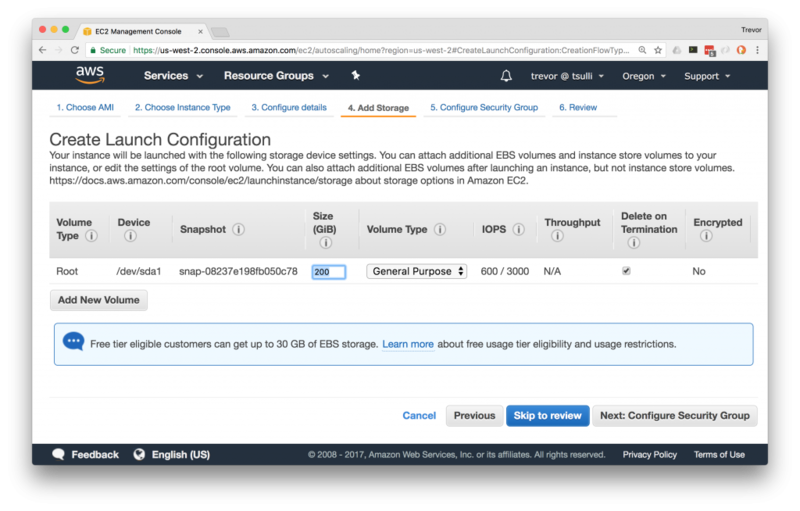 In my example, I’m instructing the launch configuration to grant a 200 GB Amazon EBS root volume to each EC2 instance that is deployed into the Auto Scaling group, once it’s set up. Now that you’ve set up the Auto Scaling launch configuration, you can deploy a new Auto Scaling group from it. Once created, the Auto Scaling group actually submits the EC2 Spot request for the desired numbers of EC2 instances when they’re needed. All you have to do is tell the Auto Scaling group how many instances you want, and it handles spinning them up or down. Optionally, you can even set up Auto Scaling policies so that you don’t have to manually scale the cluster. We’ll save the topic of Auto Scaling policies for another article, however, and instead focus on setting up the ECS cluster. The PowerShell code to create the Auto Scaling group, from the launch configuration that you built, is included below. Keep in mind that although I’ve tried to keep the code snippets fairly generic, this particular code snippet does have a hard-coded command that retrieves all of your Amazon Virtual Private Cloud (VPC) subnet IDs dynamically. It should work fine, as long as you only have a single VPC in the region you’re currently operating in. If you have more than one VPC, you’ll want to filter out the list of subnets from the Get-EC2Subnet command that are contained in the desired target VPC. After running this code snippet, your Auto Scaling Group will take a few minutes to deploy. 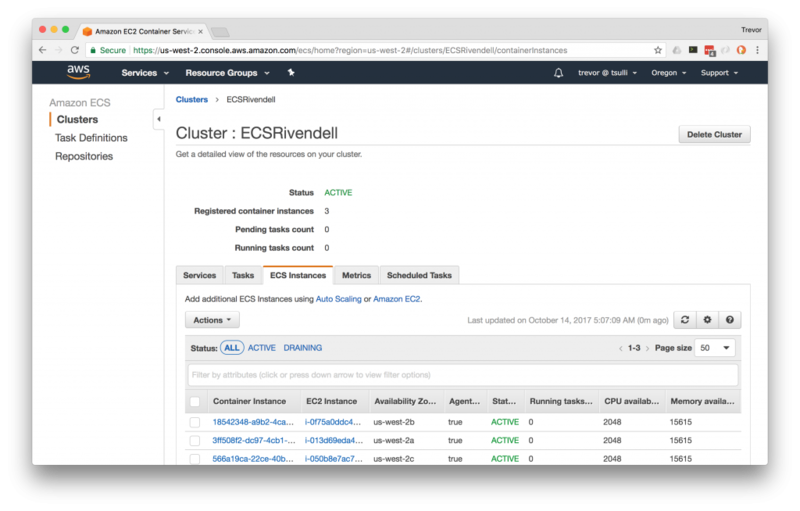 Additionally, it can sometimes take 15-30 minutes for the ECS container agent, running on each of the EC2 instances, to finish registering with the ECS cluster. 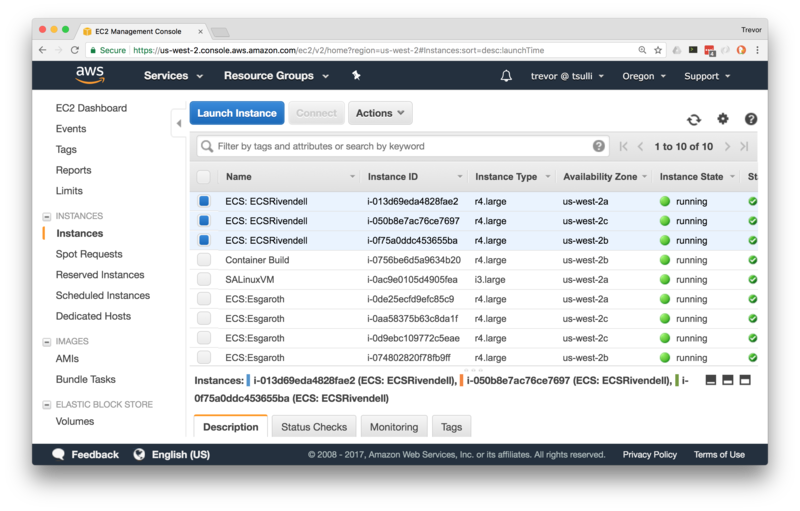 Once you’ve waited a little while, check out the EC2 instance area of the AWS Management Console and examine your shiny new container instances! You can also visit the ECS area of the AWS Management Console, and examine the number of container instances that are registered with the ECS cluster. You now have a functioning ECS cluster! You can even use the Get-ECSClusterDetail command in PowerShell to examine the current count of container instances. In this article, you set up an EC2 Container Service (ECS) cluster with several EC2 instances running Windows Server registered to it. Prior to that, you also set up the IAM policy, IAM role, and instance profile that are necessary prerequisites to ensure that the ECS cluster operates correctly. You used the AWS Tools for PowerShell to accomplish this automation, and learned about key ECS and EC2 Auto Scaling commands. Although you have a functional ECS Cluster at this point, you haven’t yet deployed any containers (ECS tasks) to it. Keep an eye out for part 2 of this blog post, where you’ll explore building your own custom container images, pushing those container images up to Amazon EC2 Container Registry (Amazon ECR), and running ECS tasks and services.